Diving in Similan Islands – Breakfast Bend skirts the entire eastern side of Similan Island No. 9 (Koh Bangu) though the northern half of the dive site is often called Three Trees or Bat Fish Bend. 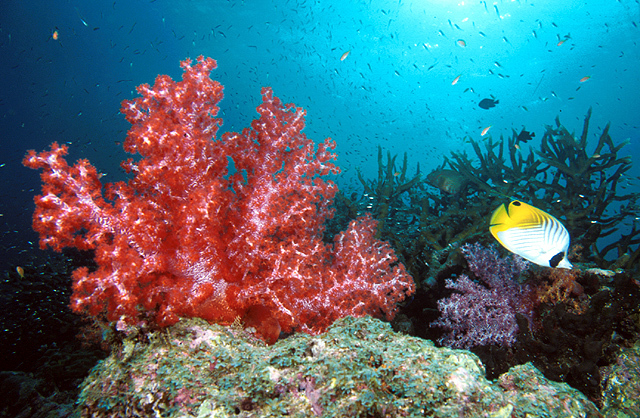 This is another classic example of how the scuba dive sites were named in the early years of Similan Islands. It was first dived at breakfast time, it’s a bend around the side of the island, hey presto there’s the name. The actual reef is made of of a sandy slope starting at about 10 metres of depth and going down to 25 metres covered in rocky outcrops and coral bommies. Large patches of Stag horn coral are broken up by patches of colourful soft coral – blue, yellow, pink and purple. At the southern end of the dive site, search the reef and look for Garden Eels and Stingrays on the sandy bottom.